About Translation: Trados: which bugs have been fixed? Trados: which bugs have been fixed? I've just received a rather pushy call from an SDL/Trados representative. He wanted to know if I was considering upgrading from Trados 2007 to the newest version. When told that I was actually consider whether to change to a competitor's product, he asked why. The reason I gave him was defects in the program, and old bugs never fixed. I wonder however, if any of the more persistent bugs have been fixed with the latest releases - as far as I know, they haven't, but I would be happy to learn otherwise. In particular, I'm thinking of such longstanding defects as the poor quality of low-fuzzy matches (see the previous post), the fact that formats are often mangled in MS Word documents, the irregular behavior of Workbench when translating MS Word tables with multiple columns (when Set Close/Next Open Get skips entire rows), the absence of shortcuts to open directly the previous segment, or the feebleness of the search functions within Tag Editor. As far as I know, all development efforts were focused on supporting Vista/Office 2007, on corporate features, and on fixing some really disastrous new bugs (if any were introduced or discovered recently). No real improvements to longstanding bugs, defects and annoyances as mentioned above. Does anybody know if this is still true, or which defects (if any) have been fixed after, say, version 7.1 and which improvements have been implemented? I'm betting most of what you mention will be cleared up in this new version. Multitrans Freelance makes me happy — look into it. There is a custom macro to go to the previous segment in Word. You are right, Riccardo. Same thing happenes when I use trados to deal with Chinese translation. The Chinese language does not leave spaces after puncutation marks, however, there is always a space after a full stop in the translation if you use trados. And the TRADOS team never seems to notice this. Your blog got me thinking about my experience with Trados when I first wanted to purchase it when I worked for a big website a few years ago. The folks actually never sent me a quote, which I found fascinating, so I decided to go with the competition (Deja Vu) and was very happy with them. I even flew a Deja Vu trainer from England to Vegas and we had a great training. 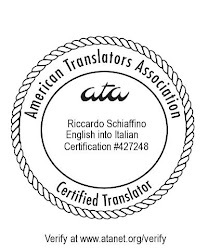 Of course, Trados is the industry standard, but we are delighted with our choice.